May Product Empties | Vanity and Everything in Between. Last month's product empties are not alot. Basing from the photo, I don't even have a makeup product empty - which is both good and bad. 1. Asian Secrets Lulur Scrub. I started using it when I saw Solenn's commercial. The claim that it whitens and smoothens the skin was secondary. Solenn is an effective endorser, haha! So did it work? I don't think so. I didn't notice my skin getting lighter than it already is. This scrub has a nice scent though and the particles didn't hurt my skin when rubbed against it. The only reason I bought this again was because this was on sale at SM - more of buy 1, take 1 for PhP130. I'm now on the second jar. 3. L'Oreal Fall Repair 3x Shampoo & Conditioner. I accidentally threw away the conditioner bottle when I finished it. I got these products from BDJ Box. Yes, this is the one endorsed by JLo. Does it work? Not so. I still experience fall out. I'm more used to having fall out that I am surprised if there it very little fall out when I shower. True story. I don't think I will buy this product again. 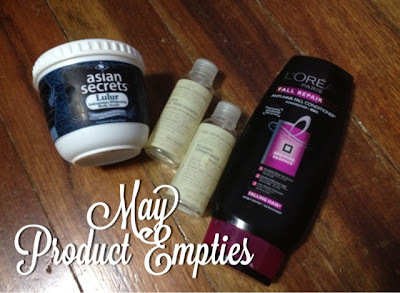 So, that's it for my second product empties! Hopefully, there will be more in the upcoming months!